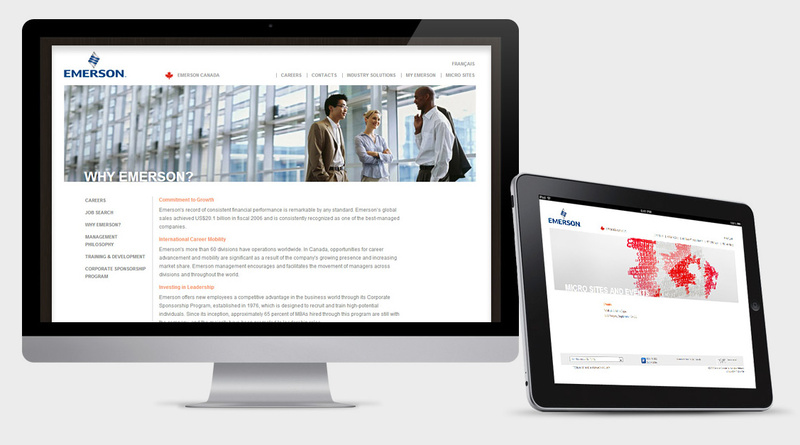 A corporate website for Emerson Canada, a leading global manufacturing and technology company. 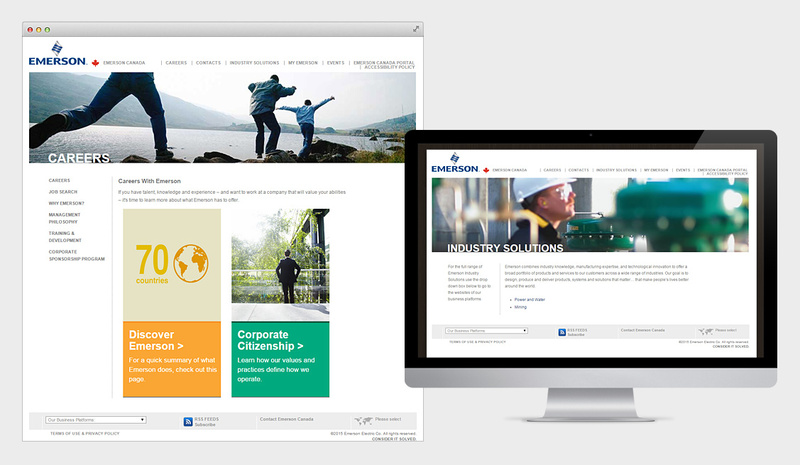 Gosek worked with Emerson to design and develop a site to house their Canadian corporate division. 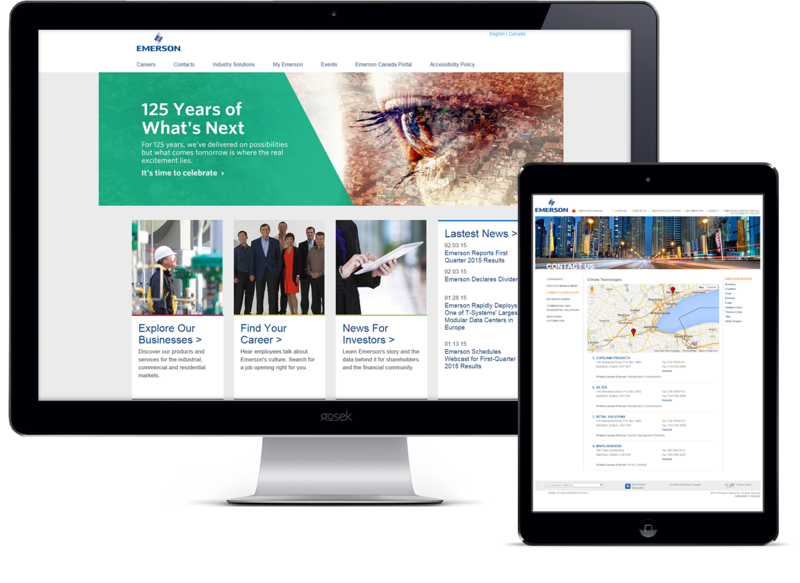 Our custom build CMS is able to provide Emerson the ability to easily update and manage their website and all its micro sites. Custom designed & build website with simple to use CMS. We have been working with Gosek for well over 10 years now and they provide us the strategic sourcing and subject matter expertise necessary to tackle a variety of web and print design tasks and challenges for us. They have worked well in a customizing their approach to fit our unique needs and culture rather than trying to force a rigid process. Their staff is well trained with broad skill sets that range from concepts, design and technical knowledge. They have also been able to learn new environments and technologies for our projects. They also value and understand our needs and that is reflected in the professionalism of their interactions. The bottom line is that they make a great partner. Gosek has worked with Bcreative for 8 years providing high quality website creative, design and implementation. Simon services us well, is a great problem solver and is very knowledgeable with the latest web technology and trends. I would recommend Gosek for any project large or small. Simon and the team at Gosek have become our go to solution for all of our digital media needs. They are extremely professional to work with, and their work displays their creative abilities, vision, attention to detail and have fast become a valuable asset and partner to our team. With a finger on the pulse on the latest digital trends, design and development tools and coupled with their knowledge of software design and development; they worked with us to mold our web design ideas into a Vision that provides both “form” (branding, style, clean look and feel) and “function” (easy for my customers to navigate). I recommend Gosek Media to anyone in need of a digital media team who is professional, capable and delivers their projects on time and with quality. From concept to delivery the experience and result is second to none. We were referred to Gosek to update our website. Simon and his team helped us create a clean, professional and efficient website that our customers can navigate with ease. Gosek followed that up by creating a B2B area where our customers can order our product online. We continuously receive positive feedback not only on how our website looks but also how easy it is to use. Simon is always available to answer technical questions and he does so fast and effectively. We would without question continue to recommend Gosek Media to those looking for website creation and hosting services. We want to thank you for your continued great help. You have been helping our company with our website for about 10 years. I can say many things, but the most importantly is what our clients say to us. We are consistently being told we have a wonderful website, very informative and easy to resource. That is what counts. With everyone sourcing out new ideas for their home, a great internet presence is essential in our line of work. We look forward to many more years of business and friendship with you and your company. Simon is a fantastic web designer – I’ve seen his create great online spaces for various businesses. I work for Simon as a freelance writer, and he always takes great care of his clients, providing them with top-notch work. I’d recommend Simon and Gosek Media for any company that requires high quality web design and implementation. Simon. You are great to work with. It’s nice to work with creative folks that understand both sides of the coin (client & creative). I’ve had the privilege of working with Gosek Media who was introduced to me by recommendation. Simon makes the business of creating a flexible and hard working website a simple process. He understands what marketers are trying to achieve with their web presence and looks at the task at hand from a business point of view. His recommendations are always thoughtful, his sensitivity to design is always recognized and his technical execution consistently exceeds my expectations. I’m more than happy to recommend Gosek Media to anyone considering a web development project. Call or drop us a note. We'd love to help. It doesn’t matter whether you are a non-profit organization, small company, startup or large corporation, you’re always welcome to contact us for your next web design project cost estimate. Are you an experienced web developer or a web designer? If you are offering web development or graphic design services as a freelancer and you like to co-work with us, please introduce yourself and share with us your work experience or portfolio.